Four years ago, I was a new mom, in a new house, in a new town with a husband about to deploy. I was craving a creative outlet, a place where I could document the progress of the new house. I started a little something called a decorating blog. I never expected anyone other than my mom to read it. I would have never guessed that not only are people reading my little decorating blog, but they are looking to it as inspiration for decorating their own home. They appreciated that I wasn't held back by rental living. I was embracing it. I received daily emails from readers asking for decorating advice and encouragement. Really?! From me? But I'm not a professional decorator! I'm just a regular mom. I don't even know the decorating rules (I'm probably breaking some). How could I give them advice on decorating? But, I've realized there are so many others out there that are just like me: normal women, who struggle creating a home that fits their family. I created Don't Wait, Decorate for you. The women who don't need a magazine-worthy home, but a real home that is just as beautiful as the people who live in it. 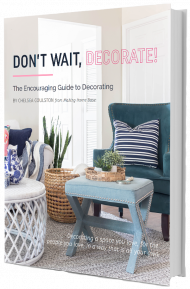 In Don't Wait, Decorate I've shared my best decorating tips and ideas, my real life experiences, plus pages full of encouragement including before and after photos. 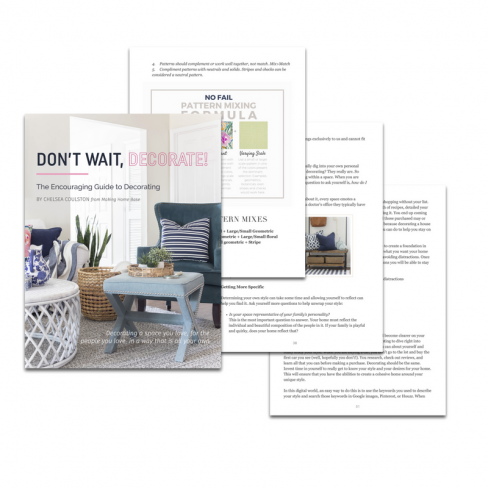 It's the eBook that will help you decorate a home you love, once and for all. "Chelsea's new book, "Don't Wait Decorate" inspired me to take a new approach to decorating. Her refreshing perspective encourages me to create a beautiful home for my family to make memories in, rather than just decorate a house. Her journey with decorating is very relatable, and her advice and wisdom on how to decorate on a budget is very practical." If you are like me, decorating doesn't come easy. It's confusing and overwhelming. I spent years in limbo, afraid I would mess it up or waste money. Figuring out color palette, where to buy quality items, and what to put on the walls had me paralyzed with fear. There is just so much that goes into decorating a space, it felt impossible for regular ol' me to create a beautiful home. 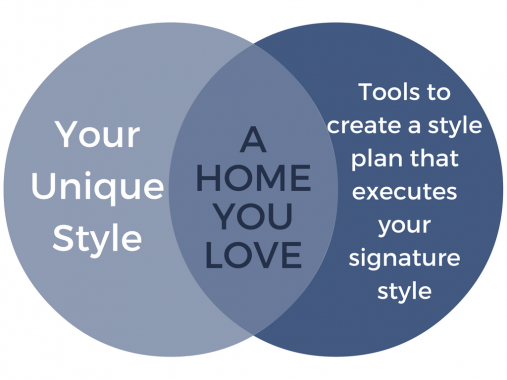 What if you could skip the frustration and squash the fear, and get straight to creating a home you love? My goal with Don't Wait, Decorate isn't to share a bunch of my own personal decorating ideas and advice, but to provide tools so that anybody who wants a beautiful home, can create it on their own. 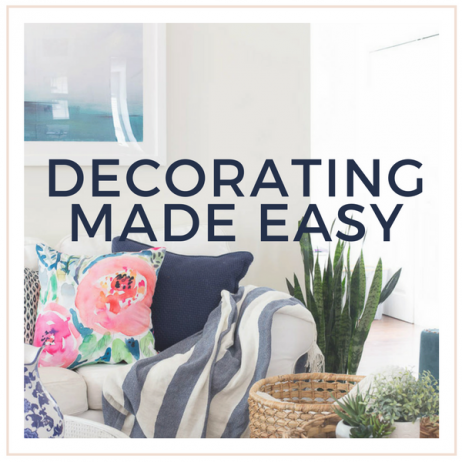 Don't Wait, Decorate is a complete decorating guide that will give you a firm foundation so you feel comfortable taking on any decorating challenge that comes your way. Not only will Don't Wait, Decorate help you gain confidence to create a beautiful home that makes sense for you and your family, but it lays out the decorating process step-by-step, so you can jump in, without fear, today! You can make a home you love, right now. How to discover your own unique decorating style so you can gain confidence to decorate any space without frustration or overwhelm. How to buy decor that you will actually want to keep forever. How to style your home with my best decorating tips from furniture placement to wall art. "Chelsea has an amazing ability to articulate all of the decorating dilemmas most of us have faced at one time or another in our lives. 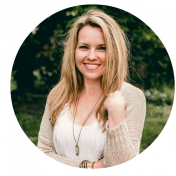 Her no-nonsense approach to creating a home you love is simple, yet somewhat profound at the same time. Many times throughout the course of reading, I kept thinking "Yes! Why have I not approached decorating this way before?" I highly recommend this book if you struggle with making your house the home you've always dreamed of. 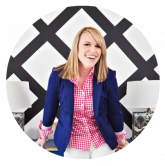 You'll walk away with actionable tips to create the perfect space for YOU and the ones you love." What's inside Don't Wait, Decorate!? 18 chapters unwrapping the complete decorating process. Part 1 - Don’t Wait, Decorate! The Philosophy Chapter 1: Why Decorate , Anyway? Chapter 3: Lies We Tell Ourselves About Decorating Chapter 4: Don’t Wait, Decorate! Chapter 5: What is a Well-Decorated Home Anyway? Chapter 6: Four Steps to Begin Decorating Your Home, Today! Chelsea does such a beautiful job of weaving her own decorating story in with practical tips and ideas for creating a home that is perfectly you, and she tops it off with words of encouragement that are truly inspiring. 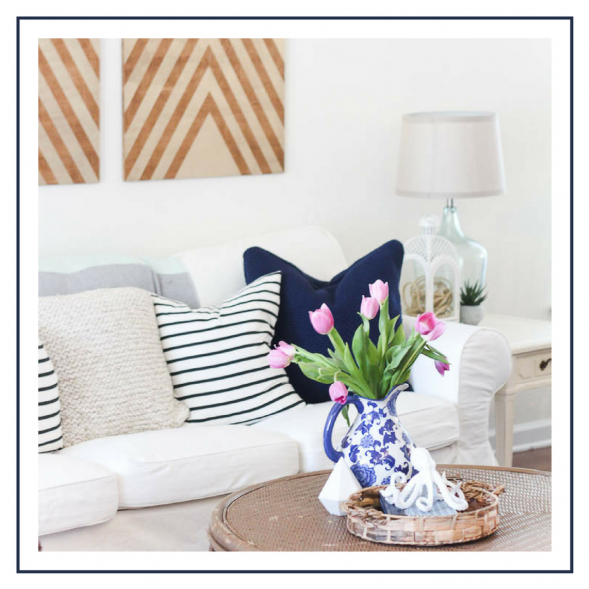 Reading Don't Wait, Decorate reenergized me and got me excited to start thinking about my personal style and decorating choices again, providing a roadmap to help me make a home that my family and I love. Ready to get started? Buy now! Hey! I'm Chelsea! 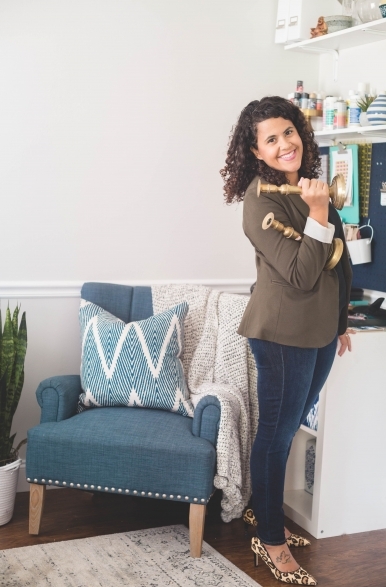 I'm the accidental decorator behind Making Home Base, where I write about decorating, DIY projects, and other creative ideas. For years, I struggled with finding my signature decorating style, giving up plenty of times along the way. When I started shifting my focus away from the house itself and onto my family, everything changed. Now, I love encouraging others to decorate for their people not for the house. I'm a wife to my husband, Matt, and mama to my two adorable girls. As a military family we move a lot so we're always up for an adventure. We're currently stationed in beautiful Jacksonville, Florida where we enjoy park days, going to the beach, sipping a lot of sweet tea. 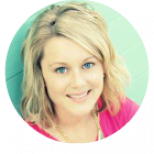 I think we can all relate to Chelsea's story of how she started out in the beginning with a blank slate house and wondering where to start. We've all done the buy-whatever-for-now-and-change-later thing which costs more money in the long run. Chelsea has broken down all her past mistakes and honed in on what she really needed to do to make her home truly one of a kind, on a budget, in whatever house she's lived in. That is huge! I agree with Chelsea that anyone can decorate their home to make it as unique as they are but it can still be daunting to know where to start. She really breaks down the process and walks through each step with you even offering no-fail solutions. I would definitely recommend this book! Absolutely! My goal with this book is to emphasis that you can decorate any space, right now. With practical tips and sound tools, I walk you through the decorating process so you are ready to tackle any space. I live in a rental, can this book really help me? Yes! While I do use my personal decorating journey as an example in the book, Don't Wait, Decorate does not focus heavily on decorating advice. The heart of the book is about you discovering your signature style and implementing it in a way that is perfect for you and your family. My decorating style is different than yours, can this book still help me? Great! I have an answer (I hope)! 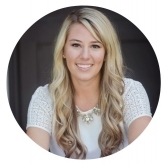 Email me chelsea [at] makinghomebase.com I will do my best to answer whatever questions you may have. "This is the type of book I wish I had when I was struggling with my own decorating journey! 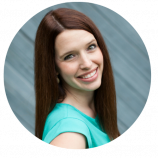 Chelsea shares approachable and doable steps that literally anyone can do, even if you think "I don’t know how to decorate". However, the truly wonderful thing about this book is the reminder that home is more than four walls and a roof, and even if you think you’re house isn't "perfect" that you can still make it a beautiful home for you and your family!" I don't really have a lot of time. Will this book take a long time to read/implement? I do a pretty good job decorating my house already, I just need some fresh ideas. Will this help me? Yes! While the book's main message is creating a home you love for the people you love, much of that is actual implementation of your decorating style. I introduce fresh ideas that I've used in my own home (some of them never seen before), while also suggesting ways to come up with your own fresh ideas! I'm on a tight budget, can't I find this information for free? I totally get that. I don't take it lightly that you are considering investing your money in my product. That means a lot. The reality is, you can't afford not to buy this book. Decorating the wrong way is expensive. The price you pay to decorate, then decorate again, and again when you aren't getting it right will cost you way more than $18 in the long run. With Don't Wait, Decorate, you'll learn your signature decorating style so you can get it right once and for all. Instead of redecorating over and over you'll be able to spend that money adding layers to your already beautiful decor. The book also provides loads of helpful information on how to decorate on a budget so you can save money while you decorate a home you love! 18 Chapters - 93 pages of step-by-step decorating guidance and encouragement with examples from my own real life decorating journey. 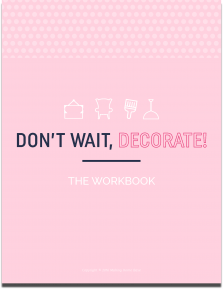 15-page workbook to help guide your decorating process. It includes the Find Your Signature Style Guide, a decluttering worksheet, design planning sheets, timelines, and more.